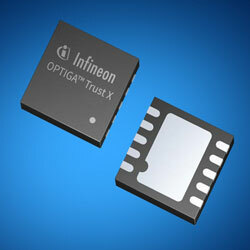 Mouser is now stocking the OPTIGA Trust X security solution from Infineon Technologies. This turnkey, hardware-based solution gives robust security to a variety of diverse applications, including IoT, medical devices, smart homes, and drones. The solution is based on an advanced security controller built on ECC NIST P256, AES128, and SHA-256, plus built-in tamper-proof non-volatile memory to considerably improve overall system security. As a turnkey solution, the device comes with the operating system, embedded applications and comprehensive host side integration support, diminishing design, integration, and deployment requirements. The device supports a high-speed I2C communication interface up to 1MHz. Typical current consumption is 20mA, which drops to 70µA in sleep mode. Compliant with the USB Type-C authentication standard, the controller is offered in both standard temperature range (-25C to 85C) and extended temperature range (-40C to 105C), in a compact 3mm x 3mm PG-USON-10-2 package.